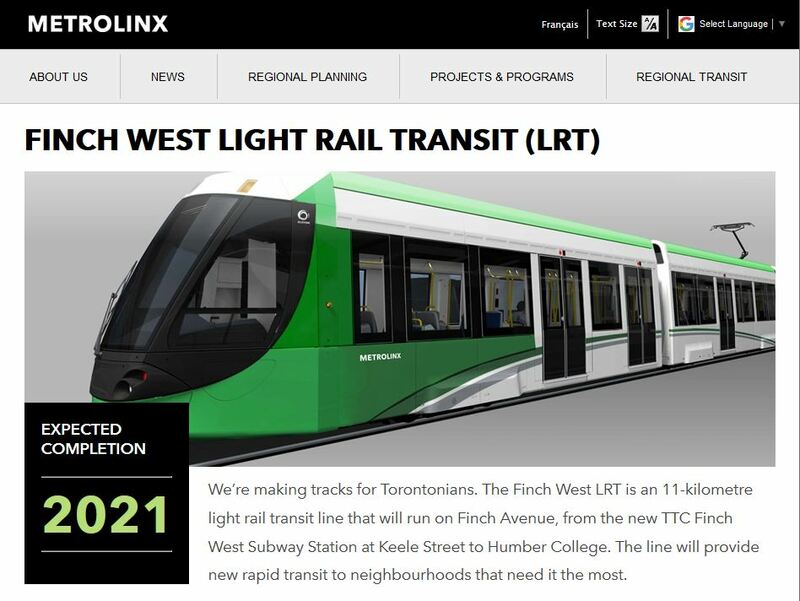 Updated September 14, 2017 at 6:00 pm: An inconsistency in the opening date for the Finch West LRT between the Capital projects update and the project’s website has been flagged by a reader. Snapshots have been added to this article. The Metrolinx Board met on September 14 to consider various reports. I have already written about the Fare Integration update, and will devote separate article(s) to the “Next Big Move”, the updated regional plan. 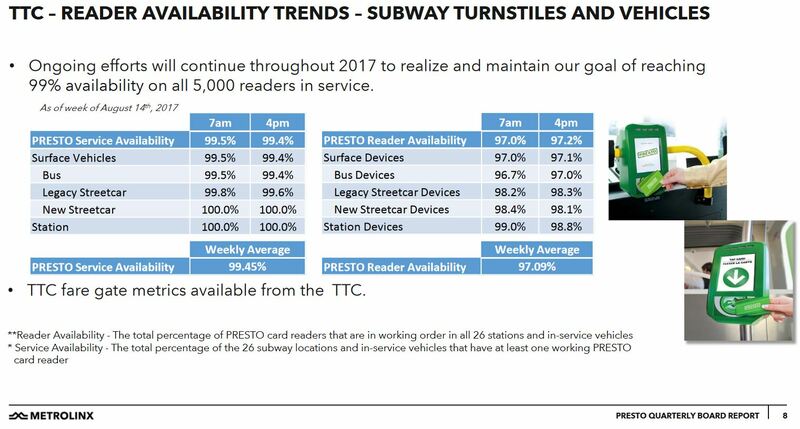 The roll out of Presto continues and TTC, even with a relatively low take-up rate to date, now accounts for more Presto taps than any other agency in the network. However, this only slightly more than one quarter of all Presto “taps” on a monthly basis (6.6 million for TTC vs about 24m for all systems). As the proportion of Presto-based TTC trips rises, TTC figures will dwarf all other agencies. Readers are now performing well, but problems remain with the add value machines. A new generation of machines is now in testing and these will be rolled out across the system in the near future, including on the about-to-open Spadina subway extension to Vaughan. There is no plan to introduce “open payments” (credit/debit cards, etc) on Presto in 2018 because Metrolinx is pre-occupied with the TTC roll out. Something might appear in the following year, but a related issue is that security standards for bank card transactions keep changing and getting tighter requiring ongoing design updates. Presto sales and reload functions in Shoppers Drug Mart stores have been well received. UPASS program core functionalities enabled as part of PRESTO Vouchers solution. UPASS program will provide discounted fares to university students in their respective districts through their local transit agency and universities. Students will be able to electronically load discounted passes onto their cards through the PRESTO Customer Website, and universities can add eligible students through the PRESTO Vouchers portal. Presto has negotiated a new agreement with various client agencies. There was no information in the presentation about how willing these agencies/cities were to accept higher service fees to fund the Presto system. 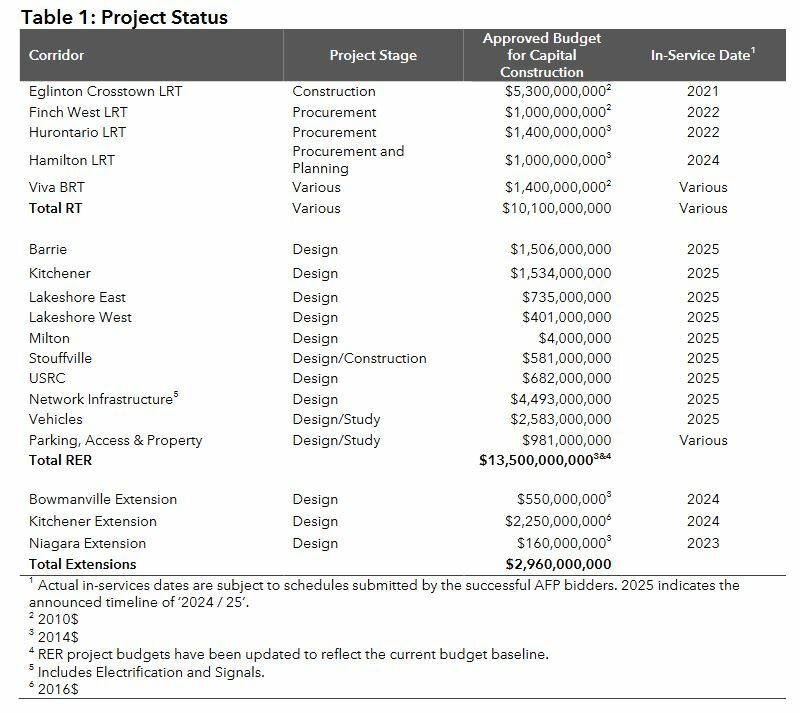 Metrolinx’ large inventory of capital projects continues, notably the Crosstown LRT, but also expansion of GO corridors. There was a lengthy discussion of Union Station capacity, and among the information that came out was that Metrolinx is considering a reconfiguration of the station with fewer tracks and wider platforms. This would provide more passenger handling capacity, a key requirement considering the anticipated rise in service on all corridors. A new layout would also imply that services would be “hooked up” east and west of Union rather than terminating there. This would considerably simplify operations. A study of Union’s future requirements will come to the Board in December 2017. Ontario is committed to running electrified trains on the GO rail network by 2025. Studying the feasibility of hydrogen rail technology is part of our due diligence to ensure that we choose the appropriate technology. This will be useful if only to get a current view of the technology’s maturity and applicability, assuming that there are no Ministerial interests in forcing a conversion on Metrolinx. According to staff, they are operating on the basis that RER will be rolled out with existing electrification technology. In the Quarterly Report, there is a status table for all of the projects. The Finch West LRT is shown with an In-Service date of 2022. However, the project’s web page shows a 2021 opening. I have asked Metrolinx to clarify this discrepancy. Thanks to reader Kass Forman for catching this. Increasing transparency in its financial, labour, realty, freedom of information, support fleet, information technology and capital projects details, so that Corporate and Administrative Costs are easier to understand. Increasingly relying on evidence-based cost drivers to strengthen the data used to allocate costs to capital and operating programs. These are fascinating claims considering the degree to which Metrolinx is a secretive organization. Far too many background studies are published, if at all, long after the Board has made a decision and the time for public input which could have been informed by such studies has passed. “Freedom of Information” should occur naturally (as it would for a municipal agency), not when it is forced on Metrolinx by a formal FOI request from the media. Easy understanding of costs will be more challenging because of corporate restructuring to amalgamate former divisions (Presto and UPX) into the main body of Metrolinx. This will make determination of the profitability or cost of individual segments that have been treated as independent divisions more difficult, along with the degree of cross-subsidy that might exist between various aspects of Metrolinx’ businesses. I asked Robert Siddall about this during the press scrum after the meeting. Siddall is the Metrolinx CFO, but is also Acting President and CEO pending the arrival of a recently-appointed CEO in October. He replied that with UPX becoming operationally part of GO Transit, it did not make sense to attempt to break it out as a separate cost and revenue centre. He was silent on the question of Presto. For 2016-17, Presto received $14.8 million in usage fees. Operating costs were not broken out. [See charts on pp 35 and 38 of the report.] Oddly, the Presto update earlier in the agenda treated the negotiation of the client agreement with UPX as if this were a completely separate agency rather than part of GO Transit. The degree to which there are cross-subsidies between GO and UPX trips and Presto is completely hidden. The line in the Annual Report about “evidence-based cost drivers” is particularly amusing given the situation at both the provincial and municipal levels. Ben Spurr in the Star has reported on political interference with the stations selected to be part of GO’s coming expansion. Specifically, the Lawrence East and Kirby Stations were originally not to be included in the list recommended to the Metrolinx Board, but this changed after intervention by the Minister of Transportation. An obvious question here is this: Metrolinx is supposed to give advice based on their expert technical studies (and whatever art they might muster). However, if the Cities of Toronto and Vaughan have new information about development plans for these two station sites, one must ask why Metrolinx staff and consultants did not have this as part of their study. How credible is any plan Metrolinx produces if “new information” can arise with clear political motives to swing decisions? 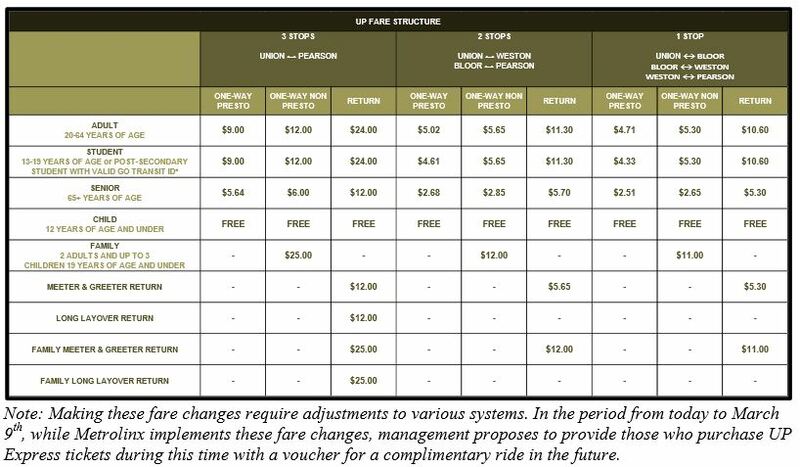 After a long period when Metrolinx was attempting a “big bang” change in fare policy, they are now trying a “step-by-step” approach intended to deal with the most annoying inconsistencies in regional policy without actually tearing the entire structure apart. Although it is clear Metrolinx would like to reach an end-state based on fare-by-distance, they will settle for an interim configuration for “two to five years”, according to Leslie Woo, Chief Planning Officer. Politically, that is equivalent to saying that the matter is deferred sine die. This would conveniently allow someone in, say, the midst of an election campaign, to promise added funding to cover the cost of bringing the TTC into a consolidated fare system, to rationalize GO transit’s fares, and to sort out some regional inconsistencies such as the TTC’s transfer policies. If Toronto adopted the two-hour transfer, this would make a seamless cross-border trip simple to implement and administer for Presto users. 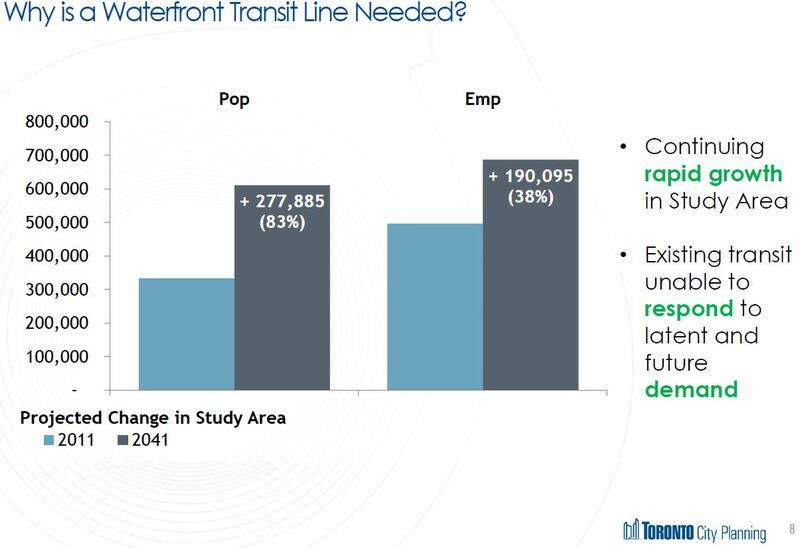 With the 416/905 barrier out of the way, the “need” to completely reorganize fares would drop substantially, and the political leverage to go “all the way” to fare-by-distance would be reduced almost to vanishing. One issue came up during the scrum, and it will be thrown into the hopper for December’s report: the integration of UPX fares with the rest of GO. It makes no sense to operate UPX effectively as a short turn service on the Kitchener line while charging different fares. Moreover, integration of UPX trips with the wider GO tariff, including any TTC co-fare, is essential if Metrolinx is to play by the same rules they expect of every other transit agency. Particularly important to any discussion about alternative fare schemes will be an open revelation of how each arrangement would affect different types of riders. Metrolinx has always been silent on the effect of a distance-based fare and premiums for “rapid transit” (e.g. subway) on long-haul suburban commuters within Toronto. Failure to publish this information puts the “debate” in the ludicrous situation of asking for a faith-based approval rather than one based on actual evidence. This kind of “planning” and “consultation” at Metrolinx must stop if they are to achieve their goals for transparency. 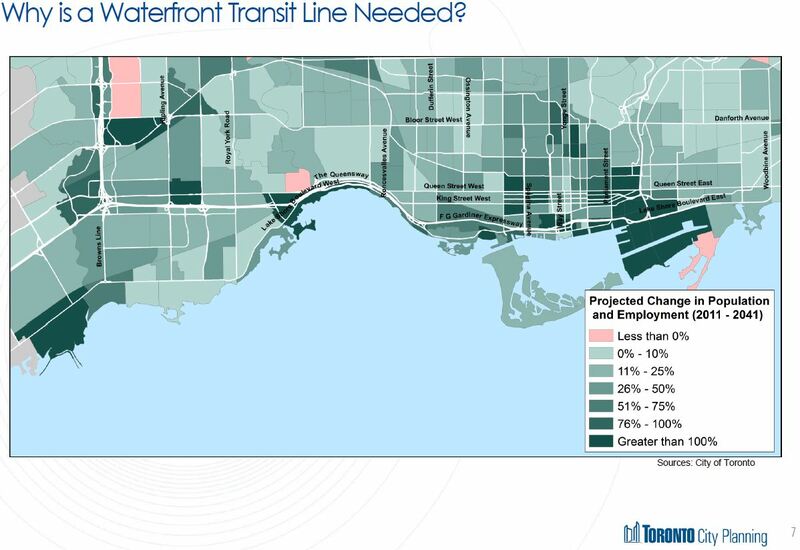 Tory went on to say that he had “a mandate” from voters to build SmartTrack in a manner distressingly reminiscent of Rob Ford’s “mandate” to tear up Transit City. The problem with both claims is that voters did not elect Tory or Ford for those specific purposes, but in a reaction against the previous administrations, particularly in Tory’s case. Moreover, that “mandate” does not mean that the platform necessarily made sense as proposed, only that it was an attraction to voters that a candidate had concrete ambitions. We have already seen Tory backtrack on his claims that Toronto did not need more bus service (responding to Olivia Chow’s half-hearted support for transit), and there is no reason for SmartTrack to be treated as a divine plan on stone tablets. As answers from staff to various questions made abundantly clear, there is a lot of work to do between now and first quarter 2016 when all of the details are supposed to return to Council. Staff went out of their way to avoid giving any indication of the way preliminary work might be headed lest they be drawn into a debate about “conclusions” before the supporting studies are in place. 1. Requested the City Manager to forward the report (October 15, 2015) from the City Manager for information to the Toronto Transit Commission, the Ministry of Transportation, Metrolinx, the City of Mississauga and York Region. 2. Requested the Chief Planner and Executive Director, City Planning to report to the Planning and Growth Management Committee on the results of the public consultations arising from the Preliminary Assessments of the Smart Track Stations, as set out in Appendix 2 to the report (October 15, 2015) from the City Manager, particularly with respect to the development potential of new stations. 3. Requested the City Manager to work with Toronto Transit Commission, Metrolinx, and GO Transit, to develop a One Map Strategy where by major intersections and/routes of these transit operators are shown on future hard copy and electronic local and regional transit maps, once SmartTrack routes and stations are established. The first recommendation is the original staff proposal simply to transmit the update report to other agencies. The second arose from a concern by Councillor Shiner, chair of the Planning & Growth Management Committee, that implications of and potential for redevelopment around SmartTrack stations be understood as soon as possible. During debate, he spoke about the success of development a long the Sheppard line, an ironic stance considering how strongly he had opposed development around Bayview Station when it was at the design stage. 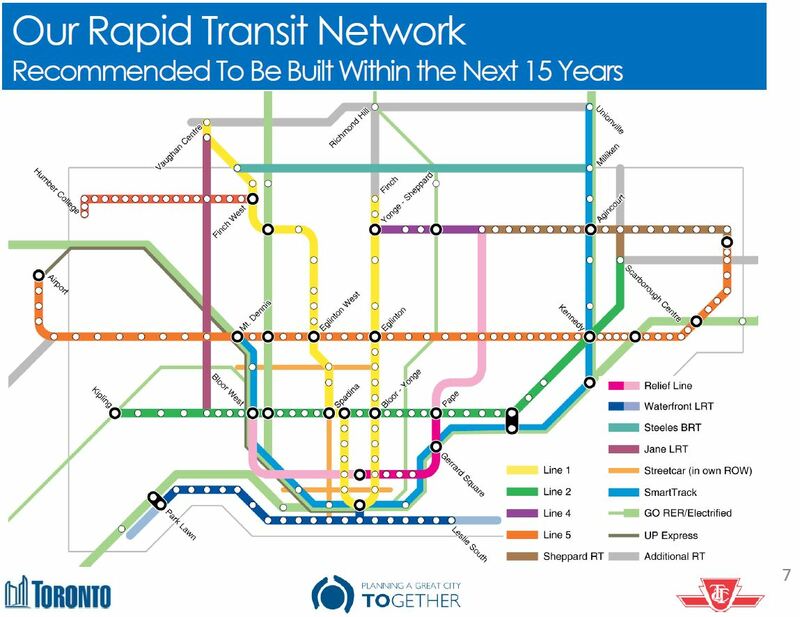 The third recommendation arose from Councillor Pasternak, who never tires of advocating the “North York Relief Line” (otherwise known as the Sheppard West extension to Downsview). His desire is that maps show all of the projects that are in the pipeline during studies, not just the one that happens to be the subject of debate. A notable absence in the staff presentation was any reference to the Scarborough Subway Extension as an alternative route for travel to downtown. 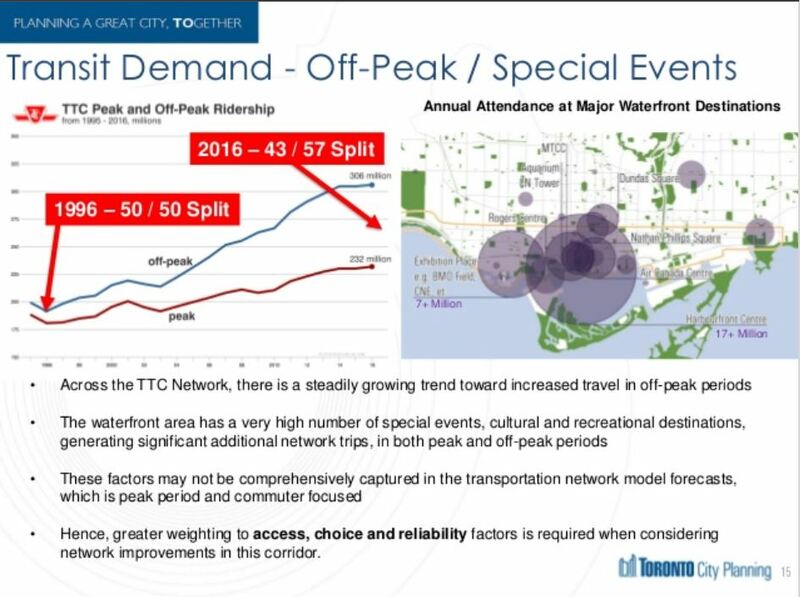 That presentation covered substantially the same information as the background reports, but it included a few new charts about comparative travel times with SmartTrack in place. 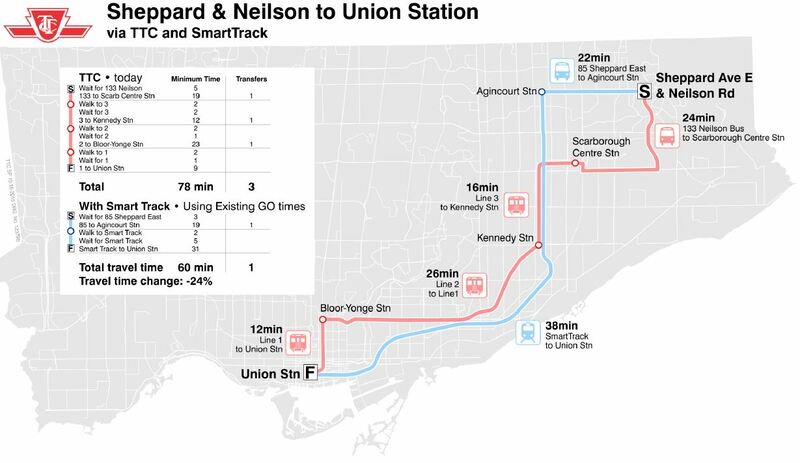 The important difference between this map [at p23] and the Tory SmartTracker website (which shows comparative travel times) is that the TTC includes the access and wait times for SmartTrack in its calculations. This reduces the proportionate saving over a trip. Another issue, of course, is that many riders do not work at Union Station, and taking SmartTrack there would be an out-of-the-way trip. This is not to downplay what SmartTrack might do, but to point out that if ST is to be part of a “network”, then advocacy for it must look at how it benefits all of the trips originating in some part of the city (say northeast Scarborough), not just those that conveniently lie on its route. 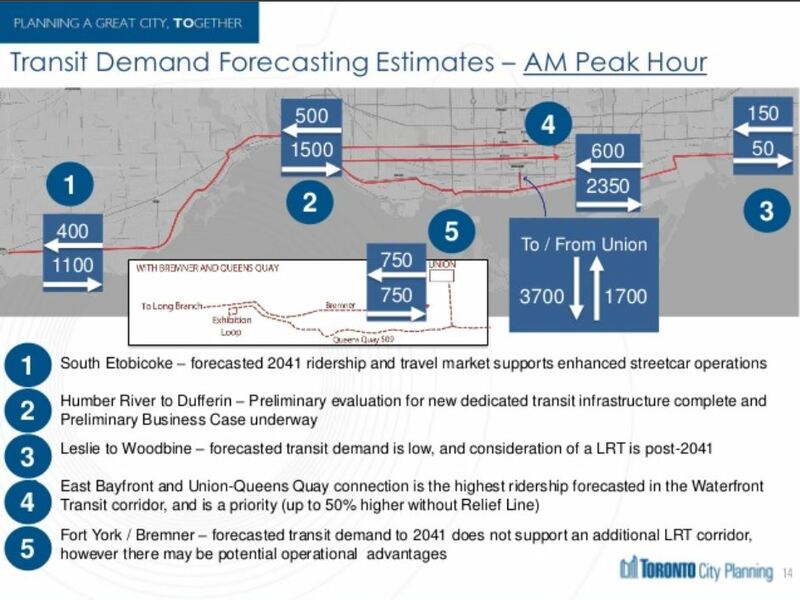 This will be an issue in comparative ridership projections for ST and the Scarborough Subway Extension because those who are bound for midtown will almost certainly have a shorter trip simply by taking the subway rather than ST.